A MAN HAS been awarded €11,500 in compensation after losing his job as a mechanic after 14 years following claims he was dismissed because he could not be depended on to turn up to work on time. The man in question had been employed as a mechanic at a garage from 1 July 2003 to 18 March 2017, with weekly working hours of 24 hours and a weekly pay of €240. In a complaint to the Workplace Relations Commission (WRC), the man said that his employer had failed to provide him with a written statement of his terms and conditions of employment in accordance with the provisions of the 1994 Act. He also claimed the employer terminated his employment without notice or pay-in-lieu of notice in accordance with the provisions of the 1973 Act. Futhermore, he claimed that his employer had not afforded him his rights and entitlements in relation to annual leave and public holidays. In relation to his dismissal, he said he received a call on 18 March 2017 from the proprietor who told him he was being let go as there was no work for him. The mechanic said he took advice and returned to the proprietor two weeks later, who informed him that there was still no work available. He then asked for his redundancy payment, which he claimed not to have received. Later, the man asked for his P45, but he claimed the respondent refused to give it to him. The proprietor then offered the complainant his job back. However, the mechanic did not accept the job, as he said he did not believe it was a serious offer and that the employer was “just trying to cover the fact that his dismissal was unfair”. In a response to the WRC, the employer said that the mechanic was dismissed by them for good and valid reasons. The employer said the mechanic was dismissed because they could not depend on him to attend work at normal times and to work normal hours, despite him being repeatedly spoken to about his absences and repeatedly warned that this could not continue and that the consequences of it would be the loss of his job. The proprietor said the complainant was a “super mechanic, a very good employee, who worked faster than the other employees and his productivity was very good, but the difficulty with him was getting him to work full days”. However, he said the mechanic didn’t work full days regularly, be it starting late, taking extended lunch breaks and missing time. The proprietor said he spoke hundreds of times over a very lengthy period and warned the mechanic that he could not continue to employ him if he didn’t work normal hours. He said that he gave the complainant every chance to improve his timekeeping but that it didn’t happen. The respondent said that eventually on 18 March 2017, when the mechanic didn’t turn up for work, he rang and said, “This can’t keep going on (missing time). I can’t keep you working these hours.” He acknowledged that he was, in effect, dismissing the mechanic because of his timekeeping record. The mechanic didn’t come to work for a further two weeks, according to the proprietor, at which stage the mechanic asked him had anything changed. The proprietor offered the complainant his job back, provided he would come to work for the full scheduled day. The respondent said the mechanic didn’t take up on the offer. He said the same offer was still open to him, even now. The employer said he had no choice but to terminate the mechanic’s employment in view of his failure to maintain a proper or reasonable attendance and timekeeping record. As a result, the employer confirmed the mechanic was replaced at his job. While they insisted they had given the complainant numerous verbal warnings, the employer had no records of these, nor could they provide dates of when they verbal warnings were allegedly given. The employer confirmed they had not given any written warnings to the mechanic and that the allegations or complaints were never set out in writing to him, nor was he ever informed in writing of the possible consequences of his alleged failures. At the WRC hearing, the employer also acknowledged they had not provided the mechanic with a written statement on his terms and conditions of employment, and that they had not provided him with his minimum notice of entitlements and or pay-in-lieu. They also accepted that the mechanic had not been afforded his entitlements in relation to annual leave and public holidays. In relation to annual leave, the employer said that when the complainant took a one-week holiday at Christmas and in August he was paid €100. After the employer presented his case, the mechanic denied that he was regularly missing from work. He said that he may have been missing occasionally, but that it was equally true that he often stayed on late after his finishing time without any extra pay. He denied that he had been repeatedly informed by the proprietor about missing time from work and that his job was at risk for that reason. He also claimed that he had never been subject to any disciplinary action of any sort during his employment. He was never given a verbal warning, a written warning, a final written warning, a suspension or any form of disciplinary action, he said. 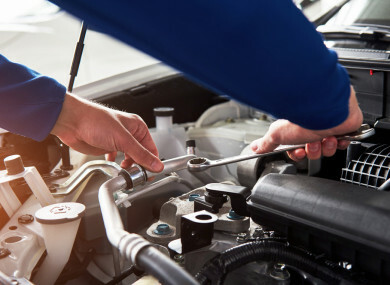 The mechanic did not seek alternative work following his dismissal as he was running his own businesses from which he said that he was receiving an average of €140 per week. The WRC officer Seán Reilly noted that while the employer said that the mechanic was dismissed for good and valid reasons as they could not depend on him to attend work at the appointed time, a number of facts were established at the hearing which could not be disputed. This included the fact that no written warnings were given, allegations or complaints were never set out in writing to the mechanic and that he was never informed of a right to be represented during any procedure. Reilly noted that the hearing on 24 October was adjourned at the request of both parties to facilitate the reaching of a compromise to settle the matter. However, the WRC was then informed that a resumed hearing was required and it was held on 18 April 2018. At the resumed hearing, Reilly was informed that €5,500 of the agreed settlement had been paid to the mechanic and it was agreed that he would take that into account in any redress awarded. “I have carefully considered the appropriate redress in the instant case and I have taken all factors into account including the views of the parties as expressed at the hearing,” Reilly said. Having been awarded compensation and redress for breaches of his rights under the Terms of Employment (information) Act 1994, the Minimum Notice and Terms of Employment Act 1973, the Organisation of Working Time Act 1997 and the Unfair Dismissals Act 1977, the complainant received a total of €6,000. With the sum of €5,500 already paid to the mechanic, he received the total amount of €11,500. Email “Mechanic awarded €11.5k after being sacked for failing to turn up to work on time”. Feedback on “Mechanic awarded €11.5k after being sacked for failing to turn up to work on time”.